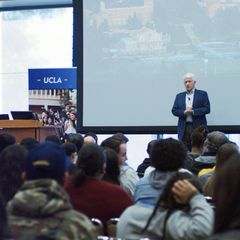 Tagged with "UCLA in the community"
About 600 Los Angeles-area eighth through 11th graders and their parents, guardians and caregivers attended this year’s “Get College Ready” event. In its decade of work, the clinic has trained 400-plus volunteers and helped more than 2,800 people secure things like employment, housing, and education. The new 50-bed Centre for Gynecologic and Fistula Care at Mbarara Hospital will treat fistulas caused during obstructed labor. Iris Cantor-UCLA Women’s Health Center partners with other organizations to help Los Angeles-area women by bringing classes to locations convenient for them. Ric Ryan, 72, has raised $125,000 to support veterans of the Iraq and Afghanistan wars. The state-funded IMPACT program provides access to free treatment for uninsured and underinsured men in California. UCLA Health joins a campaign to promote sun safety with dozens of sunscreen dispenser kiosks at Los Angeles-area beaches.